The mechanism of an electric speed controller varies depending on whether you own an adaptive or purpose-build electric bike. An adaptive bike includes an electric drive system installed on an ordinary bicycle. A purpose-built bike, more expensive than an adaptive bike, provides easier acceleration and affords more features. The mechanism of electric bike speed controller varies in these two types. The speed controller of an electric bike is an electronic circuit that not only controls the speed of an electric motor but also serves as a dynamic brake. This controller unit uses power from the battery pack and drives it to the hub motor. Different types of controllers are used for brushed and brushless motors. For adaptive e-bikes, a conversion kit is used and the controller is the main component of that kit. The electric bike speed controller sends signals to the bike's motor hub in various voltages. These signals detect the direction of a rotor relative to the starter coil. The proper function of a speed control depends on the employment of various mechanisms. 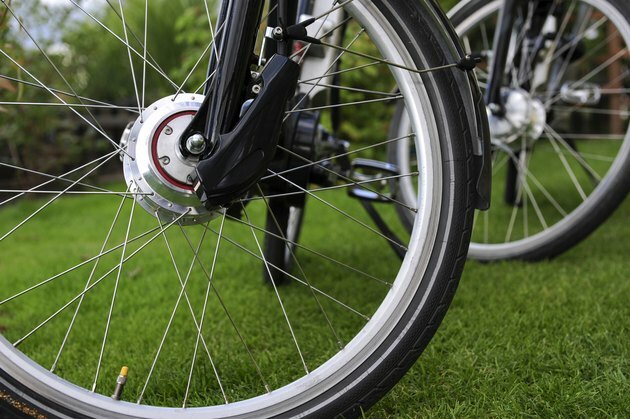 In a purpose-built electric bike, Hall effect sensors help detect the orientation of the rotor. If your speed controller does not include such sensors -- and the speed controller on an adaptive bike may not -- the electromotive force of the undriven coil is calculated to get the rotor orientation. Once you understand the basics of your electric bike speed controller, you can easily shift between the two modes of operation -- manual pedaling and electric driven. This allows you to get a good workout without overly taxing your muscles and lungs. If you're a beginning cyclist, for instance, you might find yourself breathless during uphill climbs. You can switch to your electric speed control while climbing hills, gradually reducing your dependence on the electronic operation as your endurance increases. If you enjoy biking with family and friends, the ability to switch to electric speed controls can help ensure a comfortable ride for everyone, regardless of differing abilities and strengths. The aesthetics and speed controller of an electric bike varies depends on whether you buy an electric bike new or convert a standard bike. But you might find it economically and environmentally sound to use either for transportation. Electric bikes don't produce gas emissions or noises. The top speed of an electric bike is limited to 20 mph so it reduces the chances of accident and serious injuries of the riders as compared to manually operated bikes. An electric bike costs less to operate than other fuel-powered vehicles.